The mission of the Library Media Center (LMC) is to provide the resources designed to meet the interests and educational needs of our student body. We strive to provide an atmosphere that encourages students to read for pleasure as well as develop successful research skills. 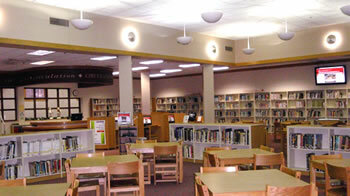 Students are able to utilize the Library Media Center individually and in an entire-class situation. The print collection houses over 6,500 novels, 2,500 reference books and 8,000 non-fiction books. There is room for 3 classes at once. The LMC circulates traveling technology and over 150 novel sets, used in classrooms. All textbooks are circulated through the LMC. The LMC has large flatscreens wired for both television and computer signals to better implement instruction and meetings. A full-size computer lab and a conference room are also attached to the facility. Even in these times of economic stress and school librarian cuts across Mid-Michigan districts, the Bay City Public Schools has recognized the importance of having credentialed librarians operate secondary-level LMCs. Handy's librarian has both bachelor's and master's library science degrees in addition to having secondary teacher certification. Students receive instruction in library use each year, as well as a start-of-year orientation regarding policies & procedures. Information on the LMC can also be found on this webpage, as well as in the Student Handbook section of the student planner. ADULT VISITORS: Every adult visitor must have an appointment, prearranged with the librarian. We no longer take drop-in visitors since LMC staffing is limited. Visitors are required to sign-in and sign-out with the school's Main Office, in accordance with district safety procedures. Overdue fines are charged for each school day every overdue book is late. Days such as "snow days", teacher professional development days, winter/spring breaks, and weekends are not counted. All student textbooks are also circulated through the LMC, as well as most teacher resources (globes, novel sets, A-V equipment, professional manuals, etc). The mission of the LMC is to provide the resources designed to meet the educational needs and interests of our students, and teach the skills to find the resources. Students are able to utilize the Library Media Center individually and in an entire-class situation. The collection houses approximately 17,000 items. There is room for 3 classes at once. The LMC also circulates traveling technology and over 150 novel sets, used in classrooms. The LMC has large flatscreens wired for both television and computer signals to better implement instruction and meetings. A full-size computer lab and a conference room are also attached to the facility. 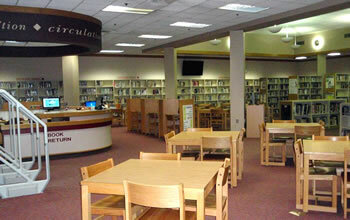 The three large, secondary-level BCPS Library Media Centers are original members of the Valley Library Consortium, and are the only school library members. Both the on-line catalog and the circulation system run through the VLC. Handy, CHS and Western are the only school libraries in the entire area with a shared catalog with all our local public libraries. More information on the LMC can also be found on this webpage, the Handy Library catalog page, as well as in the Student Handbook section of the student planner. Library Media Center Catalog: Click HERE Connect to the Handy Library Media Center on line catalog, which is part of the VLC. This is miscellaneous information relating to the Library Media Center. ©Copyright 2018, Bay City Public Schools. All rights reserved.